Happy Families by Tanita S. Davis. Grades 8 and up. Alfred A. Knopf, May 2012. 237 pages. Reviewed from digital ARC provided by NetGalley. Twins Ysabel and Justin have a pretty good idea about where their lives are headed. Ysabel is an artist and aiming to show her glasswork in some upcoming shows and ultimately go to art school. Justin is master of the debate team and his five-year plan includes getting in to Stanford. But nothing could prepare them for the curveball their dad throws them: he's a transgender person, enjoys dressing in women's clothing, and he's moving out. When Ysabel and Justin are forced to spend their spring break with him, they'll meet some other transgender people and start to heal their family. 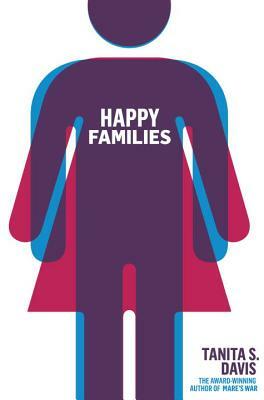 They say that all happy families are the same... but what if you had thought your family was happy all along? This is a sensitive portrayal of a family going through some tough changes. It will explicitly appeal to teens who might be dealing with a parent coming out (either as a gay person or a transgender person), but Justin and Ysabel's struggle for acceptance translates to a wide range of family problems. The twins feel like control has suddenly be wrested from them and they're not sure where to turn. Ysabel tries to bury herself in her art, but she can't shape her own family the way she can shape her glasswork. Justin reaches out on a social website for kids of transgender people, finding his only solace even as his mom laments how antisocial he's being, on the internet day and night. I liked the metaphors built into each twin's primary hobby. Ysabel is constantly forging new objects in her art just as her family is being molded into something new. Glass is still glass, even if its shape is changed. And eventually Ysabel will discover that her family is still her family, even if some things have to be different. Justin, so practiced in seeing all sides of an argument for his debate team, will have to put his skills to the test. He finds himself unable to see his dad's side in this rift, but as he learns more and starts to process his feelings, maybe he will. The dual narrative didn't really work for me, as I found Justin's and Ysabel's voices to be too similar. It was hard for me to tell them apart. I think the story might have been better served by choosing one narrator, although I did like the twins' relationship with each other. They have their arguments like any siblings, but they really lean on each other when things get tough. Not just a book for kids dealing with family problems, this is also a great book for expanding teens' understanding of what it means to be transgender. For that, I hope it is widely read. Ms. Davis includes a nice section at the end that explains what terminology to use and what words and phrases are considered offensive. Readalikes: From the Notebooks of Melanin Sun by Jacqueline Woodson, Almost Perfect by Brian Katcher, Parrotfish by Ellen Wittlinger, Luna by Julie Ann Peters and the adult nonfiction books She's Not There: A Life in Two Genders by Jennifer Finney Boylan and Dress Codes by Noelle Howey. Happy Families will be on shelves May 8!